IDEAL FOR ALL CRUMBY CLEANUPS: Need a quick touchup? No matter what the mess is from, you'll want to grab this handy sweeper to get it cleaned fast - this sweeper just perfect! SUPERIOR CLEANUP: The natural Fuller Quality bristle rotor brush has fabulous picks up power for pet hair, crumbs, dust, debris, paper clips, glass, and more. Created with reversible cleaning power - making this ideal for any home and restaurant! COMPACT AND PORTABLE: Move it from room to room without overusing a single muscle in your body - an incredibly lightweight and useful sweeper! MULTI FLOOR CAPABILITIES: Fuller Brush Quality bristles make it safe and efficient on tile, low pile carpet, and all hard floors - with very minimal effort. 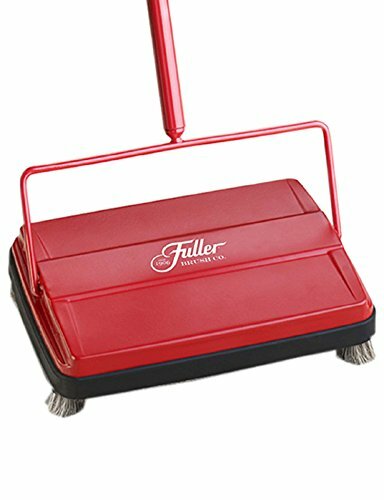 STURDY AND AGILE: Fuller Brush made with indestructible metal housing with a four section metal handle and a long-wearing, soft vinyl bumper protecting your furniture as it reaches flat under.